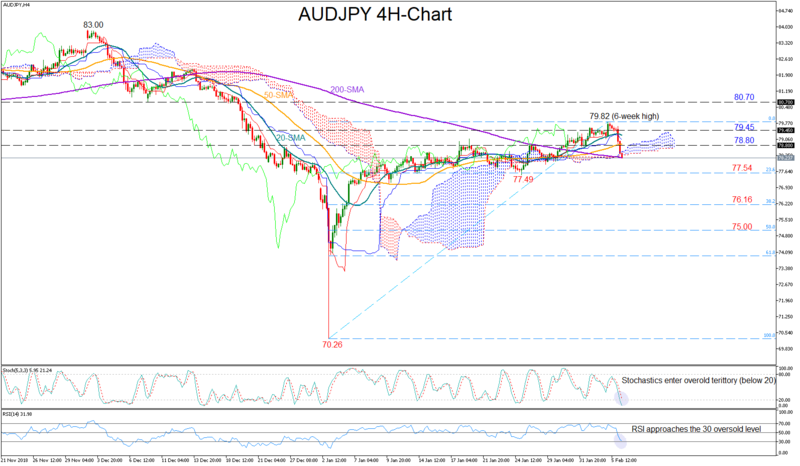 AUDJPY came under strong pressure on Wednesday, with the price reversing all the gains made earlier this month. The pair is currently testing the 200-period moving average (MA) in the four-hour chart and the bottom of the Ichimoku cloud but the RSI and the Stochastics warn that the downfall is overstretched, as the former is ready to touch the 30 oversold threshold and the latter is looking for a bullish cross below 20. Hence upside corrections cannot be ruled out in the short term. A move northward may pause near the 78.80 restrictive level, where the 50-period MA is also standing at the moment. Slightly higher, the area around 79.45 could attract attention before all eyes shift to the six-week high of 79.82. Should the bulls break that top, resuming the uptrend that started from the 70.26 bottom, resistance could then run towards 80.70, taken from the low on December 10. On the flipside, an extension below the 200-period MA could last until 77.54 which is the 23.6% Fibonacci of the upleg from 70.26 to 79.82. If the pair manages to clear this barrier, and specifically violate the previous low of 77.49, the sell-off could turn even stronger. In this case, the next targets could be the 38.2% and the 50% Fibonacci marks of 76.16 and 75.